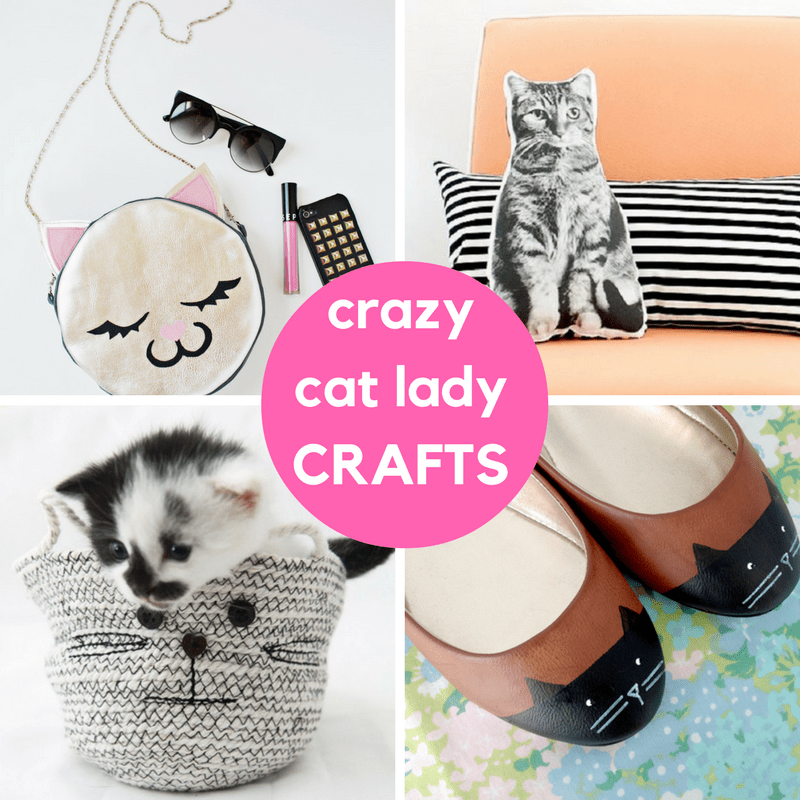 A roundup of awesome cat crafts for crazy cat ladies. I love dogs, I do. I love all animals really. But today I’m focusing on cats because… CATS! We have four cats in our house, so let that sink in for a bit. The food, the litter, the fur… And I love them all so very, very much. Even when they are jerks, which is usually. I have one on my lap as I’m typing. So, fellow crazy cat ladies (and gents), this is for you. 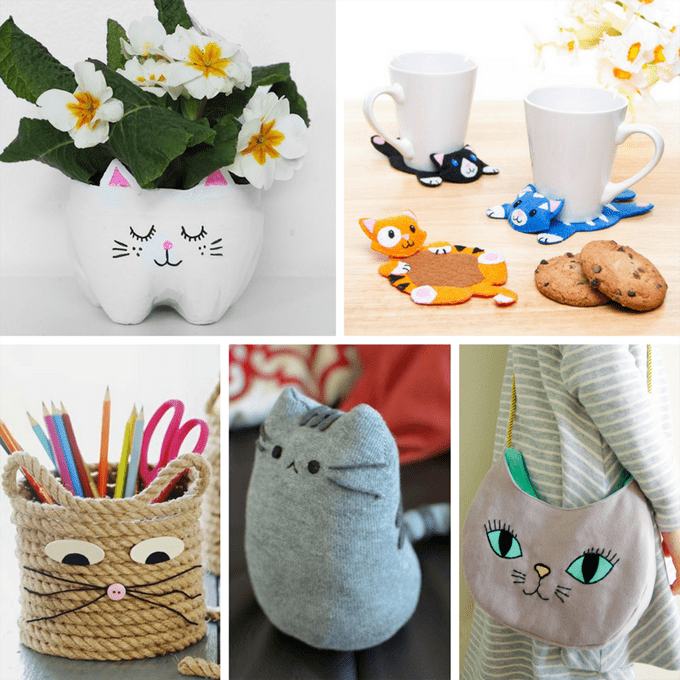 If you share my unconditional love o’ cats, here are 25 cat crafts you can make in honor of your fuzzballs. Make a leather kitty cat purse at A Beautiful Mess. 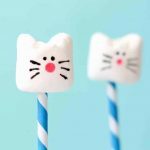 Make cat clothes pins at Design Sponge. Make kitty cat shoes at Kittenhood. Make kitty cat coasters at A Beautiful Mess. Make a cat tea pot at Make and Fable. 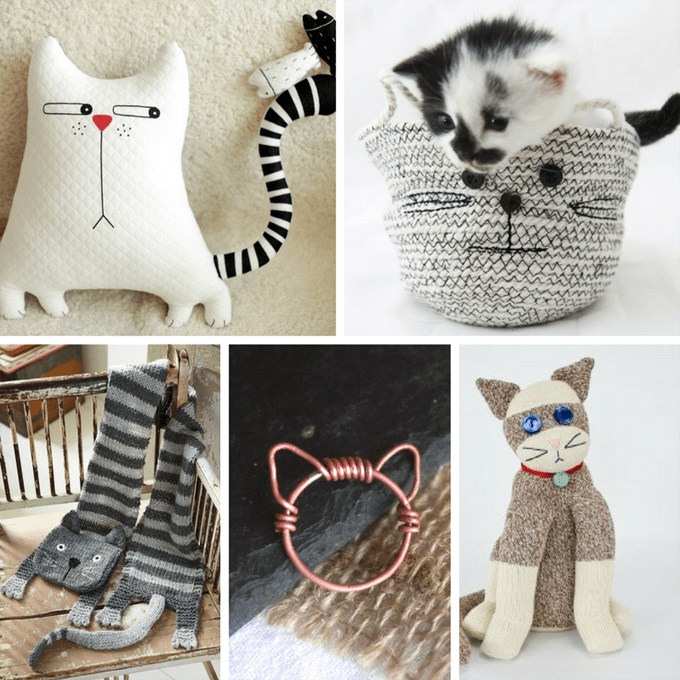 Make a cat pillow at DIY Tutorial Ideas. 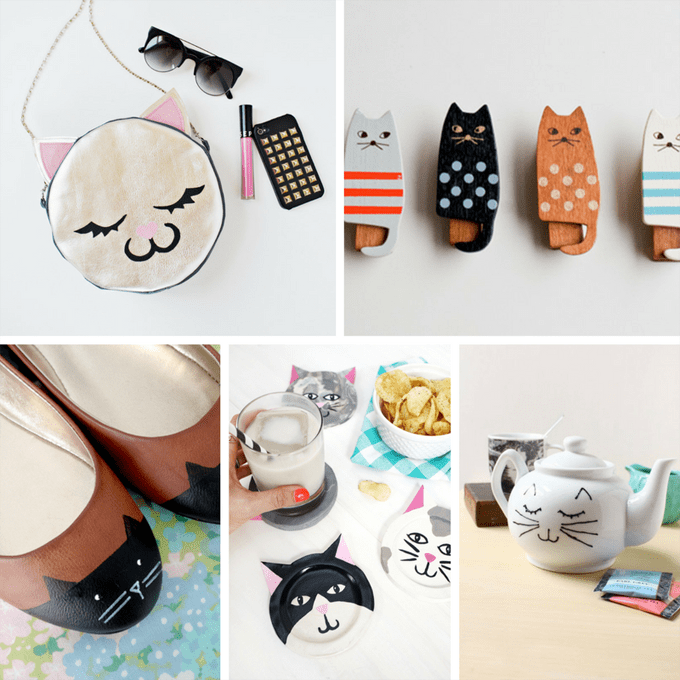 Make a cat ring holder at Small Good Things. Find a free printable for cat art at Chicfetti. 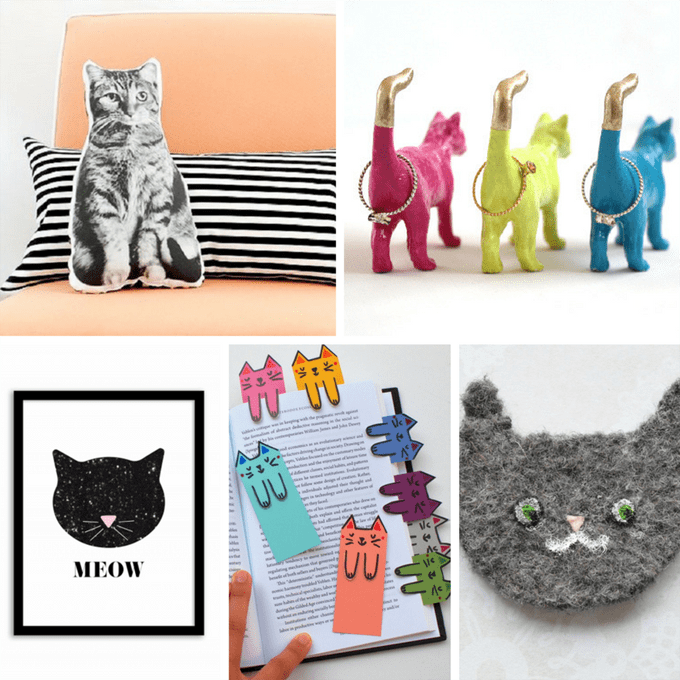 Make cat bookmarks at Pink Stripey Socks. Make a cat brooch at Pops de Milk. Make cat planters from plastic bottles at Destination Femme. Make cat storage bins at Quiet Corner. Make a cat sock plush at My Pastel Cafe. Make a cat bag at Petit a Petit and Family. Make a cat pillow at Yellow Brick Home. Make a cat rope basket at Hello Glow. Make a cat scarf at Cut Out and Keep. Make your own cat ring at Bead it and Weep. Make a sock cat at Professor Pincushion. Make a cat mug at Tried and True. Make your own cat headband at Why Don’t You Make Me. Make an aromatherapy cat eye pillow at Adventures in Making. 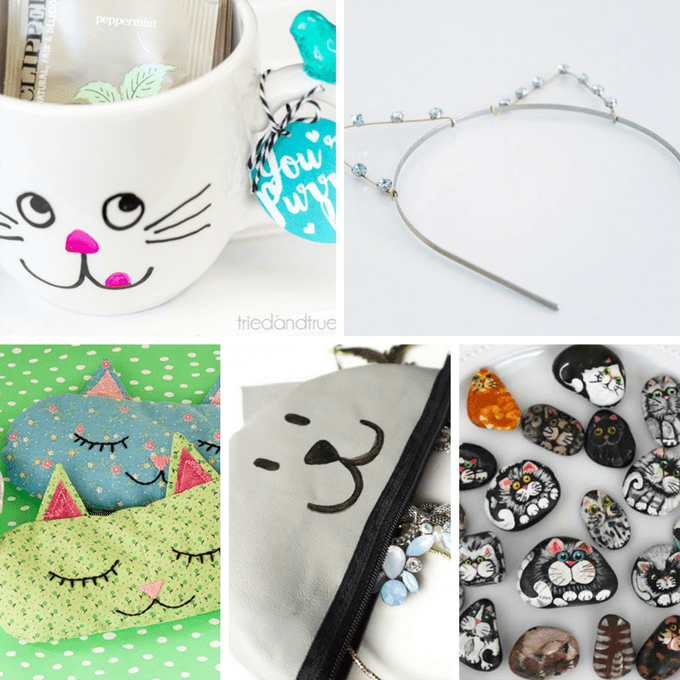 Make a cat zipper pouch at The Makeup Dummy. Paint cat rocks at Where Your Treasure Is.